Hot rice and piping hot rasam with loads of palya (vegetable) is one simple meal I really enjoy any day. Give some good pickle to go with it and it becomes a gourmet meal for me. Rasam or saaru being a staple in the South Indian meal, I can never get bored of eating it. I like eating on a plantain leaf for the flavor it imparts to food, specially if the food is hot. We tend to eat more of rasam as compared to rice and its difficult to eat on one if you are not used to it, particularly rasam. I normally make it with rasam powder, but hugely relish a change now and then. Hubby is not much of a rasam person, but likes this relatively non-spicy variation. Nimbe Hannina Saaru or Lemon Rasam, along with a lot of other traditional recipes, bring back memories of my childhood visits to my maternal grand-parents' home. The huge family comprised of lots of Uncles and Aunts, cousins, Tatas and Ajjis( as a kid left me confused as to who was who) and a few people who served the family for generations. The house had 2 huge kitchens with one of them meant for cooking lunch and snacks, the other one for the evening meal and cooking during festivals. 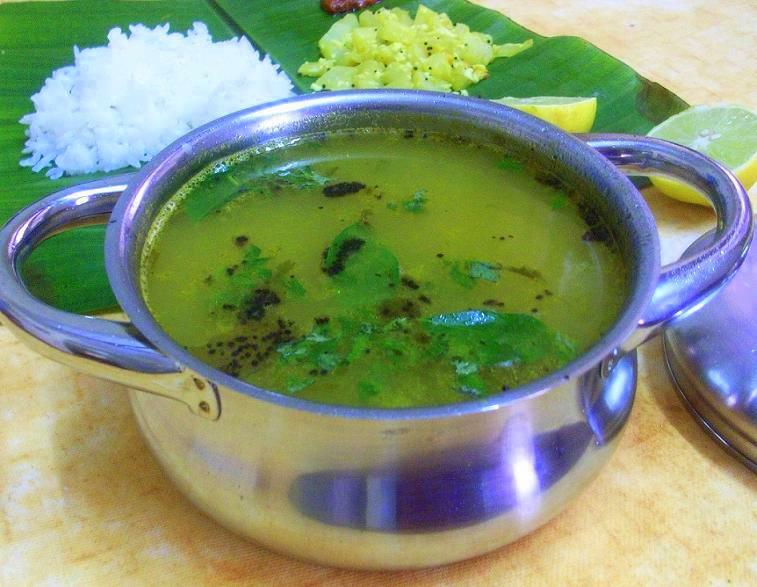 The regular rasam was part of lunch and the Lemon Rasam was what was prepared invariably with the rest of the dinner. And how we used to anticipate and love eating it, with home-made ghee and the subtle smell of food cooked on wooden fire stoves. Here is an attempt to share one of my most favorite dishes, hope you do enjoy it as much as I do.. If you could see me write this post, you could see the excitement I am barely able to contain!! I baked bread with whole wheat only and successfully!! I had tried this earlier a couple of times, but not with great results. The very first time I tried was when I had barely baked one good bread, and I failed... miserably. I had chosen a recipe not apt for a beginner and yeast let me down too. The bread turned out as dense as the Amazon forests. After the next attempt, I realized after I failed, that different kinds of wheat take different quantities of liquid. So in-spite of using my no-fail yeast, and a no-fail recipe, the bread was a failure. Yesterday, again, I garnered enough courage to try baking with whole wheat, hoping my past few successful breads have given me some sense of handling dough. And am so glad, I finally baked some Orange And Chocolate Whole Wheat Rolls, which taste good and are good textured too ! The SCS Group which promotes USA Pears, Washington Apples and California prunes, along with Caperberry hosted an exclusive tasting and lunch for food bloggers and food journalists recently. Which meant we would get to taste some pear recipes dished out by Chef Abhijit Saha, a very familiar face to me, a reader of Bangalore Food Lovers since the past few years. Having read much about Caperberry, I was looking forward to the event and eventually when I did attend it, it was a very pleasant experience. The beautifully lit restaurant with large suspended glass windows allows a profusion of natural light into the very elegant and chic dining area. Its hard not to notice this and harder not to feel envious of people who get to savor this natural light, a real luxury in city spaces. The restaurant also has an art gallery where art pieces from new artistes will be displayed and sold. As Shurthi Saha, wife of Chef Abhijit Saha put it, its a perfect place to see art in a very casual setting, even if you do not know the intricacies of painting and art. Tasting and getting to know USA pears was a revelation in itself. Having eaten only the Chinese pears so far, I loved the taste and texture of the USA pears. Really juicy, sweet, buttery in texture, your taste buds will ask for more. They come in different colors,shapes and flavors allowing you to play around with them in your salads, drinks, main course and desserts. You could of course eat them raw, grill them or poach them and they will give you delicious results. USA pears are sodium free, fat-free, cholesterol free and an excellent source of Vitamin C. The best part of is pears provide 24% of your daily fiber intake. And for only 100 calories per serving! - Source USA Pears. USA pears claim to be one of the world's finest pears, available in India from September to February. I would surely say yes to pears and their versatility. Absolutely loved it in the very refreshing Virgin Pear Sangria, in the Grilled Pears Stuffed with Cherry Tomato Mozzarella (wanted more of pesto sauce for the very first time!) and as the very delicately flavored saffron poached pears among other things. And we all got to take home some pears as well as some prunes and I was itching to try out my hand at cooking pears. 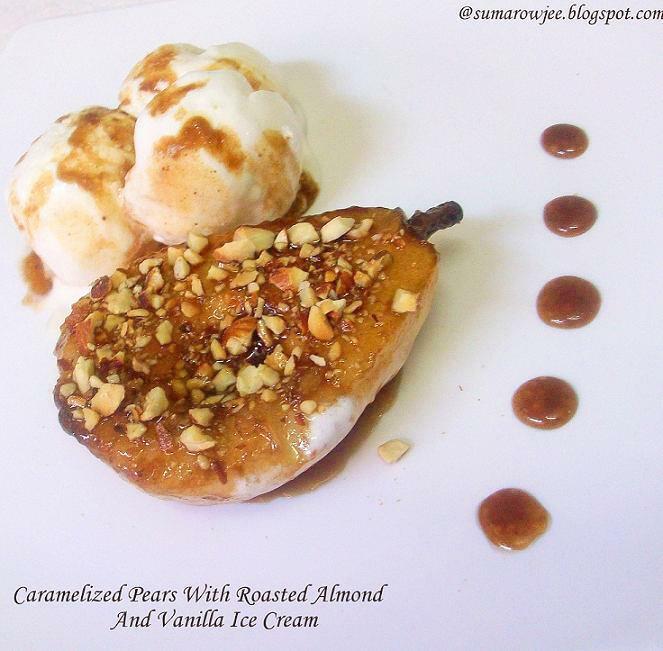 Being the dessert loving person I am, simple and quick, yet delicious, Caramelized Pears With Roasted Almond And Vanilla Ice Cream seemed to be the perfect dessert on a lazy Sunday afternoon. I just can't wait to show you my first Apple Pie! Well, my first pie ever to be precise! I had bought a pie tin and tartlet molds years ago without even the faintest idea as to what I would do with them. But of course never got to baking a pie for some reason I don't really know. Until I started to look for new things I can try. 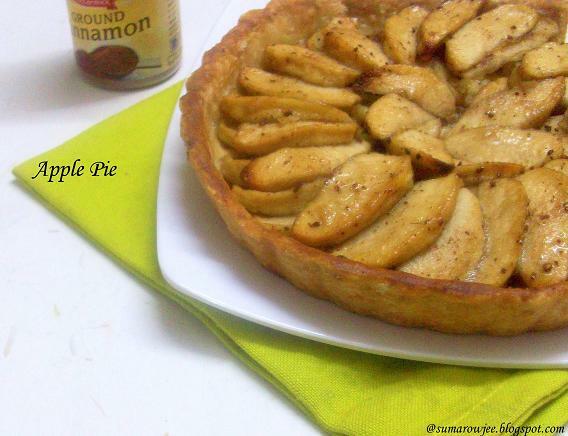 A pie seemed a good idea, specially since I had some Granny Smith apples in my fridge. I am the fruit eater in the family and have to generally push hubby and kids to eat fruit. But when I save fruit for a specific purpose, I have a tough time keeping them from eating it:). And my kids complain that 'I don't let them eat even something like a healthy fruit'! This in the context that my kids keep raiding the fridge for chocolates, butter or cheese slices which I painstakingly hide from their prying eyes. They do get away with eating some of these things, with and without my knowledge...sometimes with a chastising mini lecture and sometimes to allow some small kiddie indulgences..
After Tiramisu Cake, I just had to tell you about the mascarpone cheese I made at home, how could I not! Sounded like a simple enough process, but somehow a bit intimidating as a thought for some strange reason. 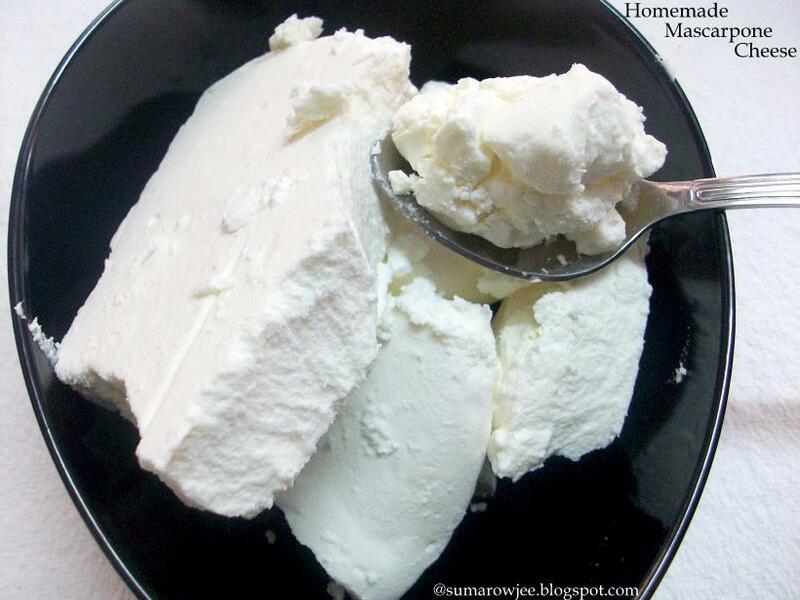 I very rarely make cottage cheese or paneer at home, so you can imagine me shying away from making mascarpone. I do love cheese in my pizza and pasta when we eat out, but cheese at home is limited to getting slices of low-fat cheese for the kids' sandwiches. I finally took the plunge and made Mascarpone Cheese and absolutely loved it! I am not a butter cream person at all and most of the cakes I make are with whipped cream as you would have noticed. Oh, you did not ?? ! !, puhleez do!!:). Mascarpone added a delicious new dimension to the taste of the frosting and am I glad I got introduced to it! It made a finger-licking, lick-the-bowl and lick-the-spatula uber yum coffee mascarpone. Thanks so much Vera for this recipe which has created quite a stir! And you can surely expect more versions of the Tiramisu and more desserts with mascarpone on Cakes And More..
And The Cake Bible Goes To...! Alright! I meant to put this up within exactly 24 hours of the round up, but couldn't do so due to some logistical reasons. The round up here once again... Have included the 6 entries I had missed out earlier, so making a total of 65 entries. Congratulations Divya!! Please mail me your shipping address and your win will be on its way!!!! Here I come with the round up and a little adrenalin for you! I could actually hear some of you muttering away as to what can take someone so long to post a round up and announce the winner:). Specially since I had mentioned the last date for accepting entries as 8th January and the round up on 10th January. I know there are no excuses for this , so my apologies! For those of you coming in late, I had announced an event and a giveaway as my blog turned one. 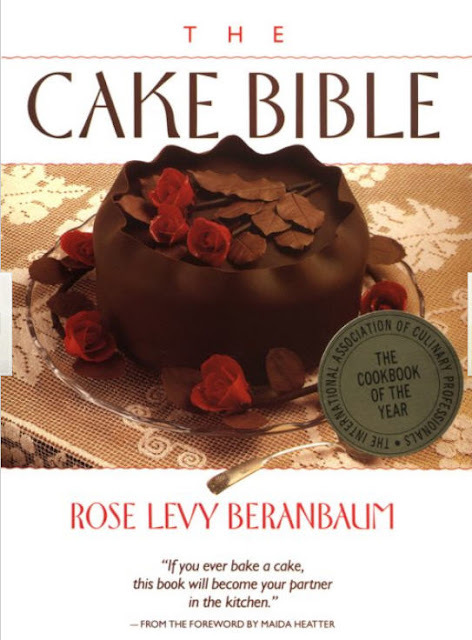 And the giveaway is The Cake Bible by Rose Levy Beranbaum! This book actually needs no introduction , being a very famous book by a very famous author and a must-have on the shelf of every true-blue baker. The response has been very heartening and I have received 61 entries (55 if you exclude my entries and yes, all of these are fresh posts). 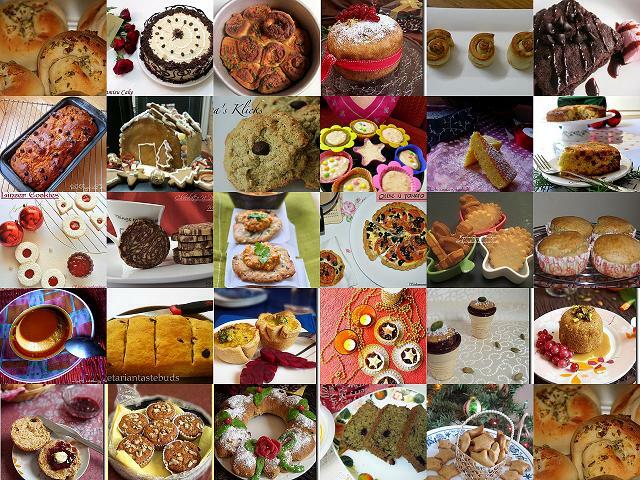 My heartfelt thanks to everyone who has participated, am truly honored you took time to bake something for me. Without further ado, here comes the round up. A visual treat for all us bakers looking out for new and inspiring bakes to fill our homes with the aroma of baking and the satisfaction it brings. 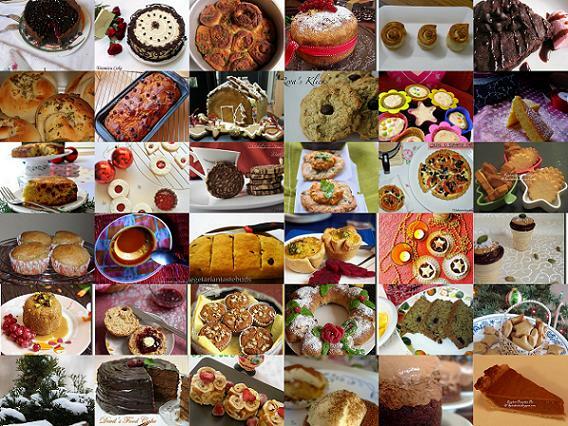 Here are 60 recipes for you to try out...I hope I have not missed out any entries here, if I have, please do mail me, I will immediately include yours. Oops...!!! 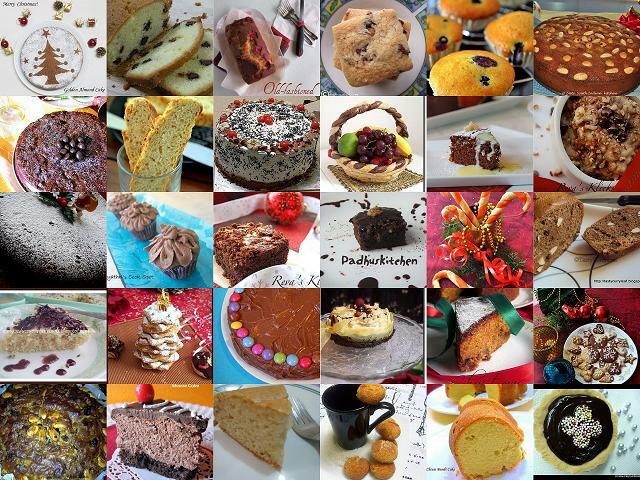 Have missed out on 6 delicious entries! Have updated them, sorry about this ladies..
Oh, did I tell you that I loved thrillers as a kid before I got buried in cook books? Thought I will put you on the edge of your seat for a while;-)... I used to hate it when an episode ended right at the time you would know who was the culprit..But then it was real fun too. I like to build a little more anticipation and suspense... I will announce the winner real soon..Watch this space, winner to be announced very, very soon!!! Cross my heart!! We turn one today!! Happy Birthday Cakes And More! Thanks to all my friends and readers for helping me reach this milestone, look forward to your support and love for many many more years to come! Festivity and cheer continue to be in the air in our home post Christmas and New Year as hubby celebrates his birthday in the first week of January. Kids get all excited about the return gift he will 'have' to buy gift them! They hush-hush about the surprise small cards they make for him (right under his nose!) and give it to the groggy-eyed Dad first thing in the morning screaming "Happy Birthday's. My three year-old daughter drew a house, half-colored it and scribbled a curve, maintaining that it meant "Happy Birthday'. My eight- year old son, not to be left behind, made a pop up card with gizmos drawn all over it. They reluctantly went to school, thinking its unfair they must go with a birthday being celebrated at home. A promise of a dinner out and the ceremonial birthday cake does help in getting them ready to school. Whew! My passionate entrepreneur hubby takes off to work as usual promising to come home early - just when the kids' and my phone calls begin to get more and more frequent. And then I get to finish my cake baked the day before and hidden away. The allure of a coffee soaked cake, filled and frosted with coffee mascarpone is too much to resist for a die-hard coffee lover like me. I just needed that special occasion that would have me happily putting in that time and effort for this particular cake. 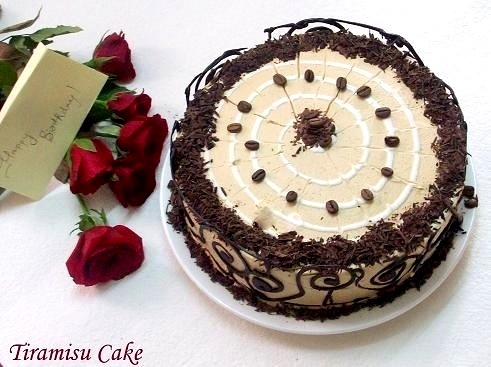 A cake which has haunted me since long - Tiramisu Cake. "Good bread is the most fundamentally satisfying of all foods; and good bread with fresh butter, the greatest of feasts." - James Beard . If you would have to believe this quote, you would have to bake bread at home, fill your home with the aroma of freshly baked bread and eat it. When I started to bake and until very recently, a bread never figured on my list to try out. It was just a lifesaver to pick up from the supermarket and have on hand in my bread box. The versatility with breads restricted to a variety of sandwiches, bread upma or a french toast. A couple of tempting sounding loaves from a famous bakery left a lot to be desired in terms of taste. Paah!! So is that all that's there to breads, I was left wondering. 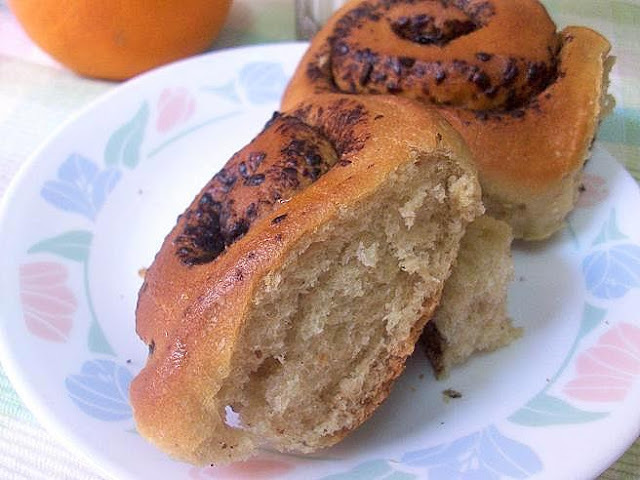 Only after I started baking bread, I realized, there is so much more to a bread per se. I will tell you why I am telling you all this - if you have not baked a bread yet, please, please do! Don't shy away from yeast. I promise, you will enjoy baking breads - tremendously. There is no reason why you shouldn't as you would be baking gourmet bread to suit your taste at home! After a couple of successful breads with all purpose flour, I tried baking bread with just whole wheat flour. I admit, I have not been very successful, not yet - am optimistic I will succeed after torturing my family with just a few more misses:-) . Different kinds of whole wheat take in different quantities of liquid. And the ratio of liquid to the flour being accurate is the key to a great textured bread. This being the case, you would need to know what you are doing, when you are baking a bread with only whole wheat. I made an attempt at baking bread with a mixture of whole wheat and plain flour and loved the end result. 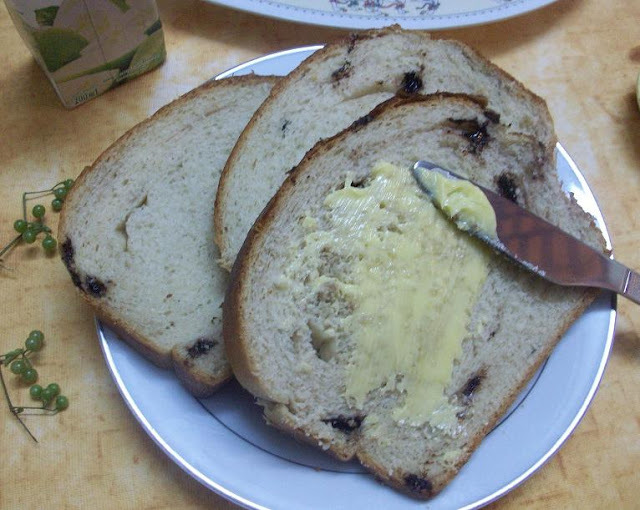 The Chocolate Chip Bread was light textured and just delicious toasted, lightly buttered and drizzled with honey. In fact, we baked this bread a friends' place too. She took one look at the big loaf baking in her microwave and remarked that a loaf of bread usually lasts a week at her place and this huge a loaf would probably last even longer. Surprise, surprise! when she found that the entire loaf disappeared at breakfast the next morning:-). This is one of those recipes, you must, must give a shot at and you will find yourself baking this time and again. Wish You A Very happy New Year! Having left behind a wonderful and memorable 2010, hoping to have an even better 2011. School reopens today after the Christmas break and I am one of those relieved and wickedly happy Moms to be seeing the kids off to school. Even if it means missing the luxury of snuggling cozily into the blanket and waking up late at 7.30 as compared to my otherwise earlier start at 5.30. Sigh!! I know, I always sound like Cinderella's step-mom when I talk like this, but sleeping in late is a luxury I would gladly forgo, compared to having four and half hours of peace and having my home all to myself. So when the world has weekend blues, I guess I am one of those people who would happily welcome a Monday morning anytime:-). Yes, I am done with cooking, cleaning and my walk by 8.30 so that the rest of my morning can be spent on baking and work. Counting my blessings, I am one of those lucky few, who have the luxury of working from home and also have enough scope to fuel my passion for baking. 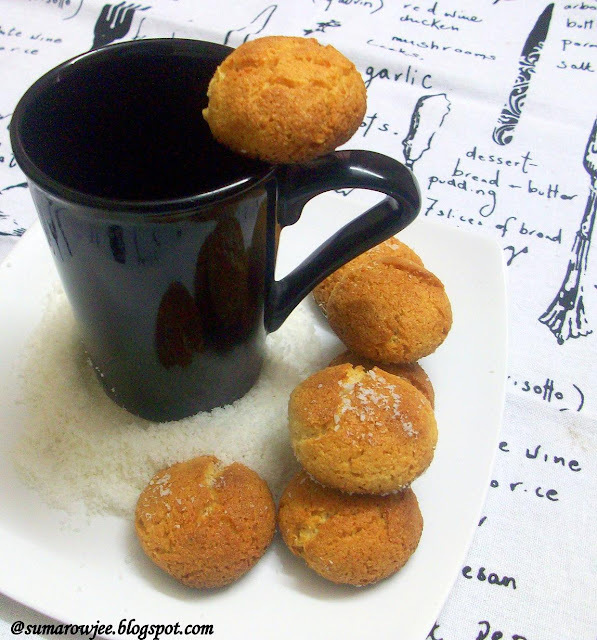 On this positive note, here's a sweet beginning on Cakes And More with some Eggless Coconut Macaroons I baked yesterday. These are extremely easy and quick to make and taste delicious! You hardly need any time to put these together and you can sink your teeth into these sweet things, which are crispy on the outside and chewy inside.